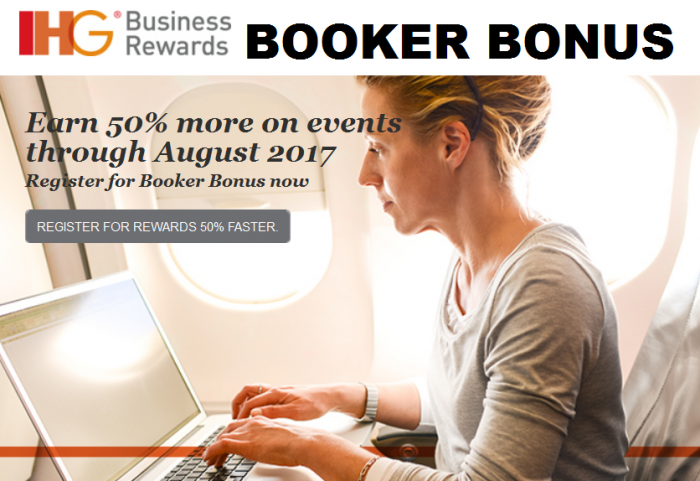 IHG Business Rewards has launched a new promotion for a 50% booker bonus on events consumed between September 1, 2016 – August 31, 2017 (booked September 1 – November 30, 2016). There is a separate supplementary bonus of 5,000 points for single event worth of $10,000 to $19,999 and 10,000 bonus points for $20,000 or more. Note that the maximum spend for the 50% booker bonus is capped at $20,000 spending. You can earn the supplementary bonus an unlimited number of times. Most of the programs are offering bonuses for people that book events, conventions and multiple rooms. Worthwhile to sign up for those that will book an event or two with IHG during the offer period. General Promotion Terms: These “General Promotion Terms” shall govern this Promotion. In order to participate in the Promotion you must be an IHG® Business Rewards Member, have accepted the IHG Business Rewards Program Terms and Conditions (www.ihg.com/businessrewards), and registered your Membership number to this Promotion (“Registration”). Upon registration, Members will be presented with the opportunity to earn 50% extra bonus points (4.5 Points for every US$1 Spend instead of 3 Points) (“Promotional Points”) on Qualifying Spend up to the value of US$20,000 per Member during the Promotional Booking Period. The Promotional Booking Period in which Bookings can be made under the benefit of this Promotion will run from September 1, 2016 to November 30, 2016 (“Promotional Booking Period”) for Qualifying Stays during the Promotional Stay Period which will run from September 1, 2016 to August 31, 2017 (“Promotional Stay Period”). Spend for Events booked outside of the Promotional Booking Period will not count toward Promotional Points. Spend for Bookings made prior to Registration will not count toward Promotional Points. This Promotion cannot be combined with any other offer. Qualifying Spend can be made up of multiple events and/or single event up to the value of $20,000. If a Registered Member has a Qualifying Spend of US$5,000 during the Promotional Period then the Member will earn 4.5 Points for every US$1 totaling 22,500 Points. If a Registered Member has a Qualifying Spend of US$20,000 during the Promotional Period then the Member will earn 4.5 Points for every US$1 totaling 90,000 Points. If a Registered Member has a qualified Spend of US$30,000 during the Promotional Period then the Member will earn 4.5 Points for every US$1 on the first US$20,000 (90,000 Points) and 3 Points for every US$1 for the remaining US$10,000 (30,000) totaling 120,000 Points. In addition to the Promotional points for Qualifying spend as outlined above, if a Registered Member spends between $10,000- $19,999 on an individual booking, they will receive 5,000 supplementary points. If the Registered member spends $20,000 and above on an individual booking they will receive 10,000 supplementary points. For example: If a Registered Member has a Qualifying Spend on any individual booking of US$10,000 they will receive a further 5,000 supplementary points in addition to the 45,000 Promotional Points outlined above totaling 50,000 Points. Please note, if the Registered Member has reached the threshold of $20,000 for Qualifying Spend and received the Promotional bonus points, then ONLY supplementary points for individual high-value bookings will be available and no further Promotional Points will be awarded. There is no limit on the number of high-value bookings that may be made, and supplementary points will be received for each individual high-value booking. Promotional Points can be achieved by booking Qualifying Room Rates for Accommodation and Meetings Bookings when booking on behalf of others in accordance with IHG Business Rewards Program Terms and Conditions (www.ihg.com/businessrewards). Qualifying Spend is defined per IHG Business Rewards Membership Terms and Conditions (Clause 1) at Participating InterContinental®, Crowne Plaza®, Hotel Indigo®, Holiday Inn®, Holiday Inn Express®, Staybridge Suites®, Candlewood Suites®, EVENTM or HUALUXETM hotels worldwide. Bonus points are not issued on Non-Qualifying Room Rates or Non-Qualifying Stays. Non-Qualifying Room Rates or Non-Qualifying Stay include the following: Net wholesale individual and group rate, certain package rates, employee discount rate, friends and family rate, crew rate, special discounted contract rates, seasonal worker/crew rate, 50% travel club discount rate, travel industry discount rate, distressed passenger rate, IHG Rewards Club Reward Nights/Airline Hotel Reward rate, most rates booked through most third-party websites, complimentary hotel Stays and any other rates not defined as a Qualifying Room Rate at IHG’s sole discretion. Promotional Points earned through the Promotion can be used for redemption opportunities toward Reward Nights, merchandise and other redemption opportunities. Redemption options listed in Promotional materials are examples of redemptions only and availability and points to redeem varies by country. Other redemption opportunities are available in the IHG Rewards Club catalog. Please visit www.ihg.com/rewardsclub to see all redemption options available in your country. Points earned through the Promotion will be awarded up to 60 days after the end of the Promotion Stay Period. This Promotion is subject to standard IHG Business Rewards Membership Terms and Conditions and earning structure, which can be obtained by visiting www.ihg.com/businessrewards. Any capitalized terms used herein and not specifically defined shall have the meaning ascribed to them in the IHG Rewards Club Membership Terms and Conditions. This exclusive Promotion is valid and applies to the original recipient only. To the extent permitted by applicable laws, IHG reserves the right to remove a member’s Bonus Points if fraudulent use of the Promotion is detected. To the extent permitted by applicable laws, IHG Business Rewards reserves the right to cancel, suspend and/or modify the Promotion at any time with or without notice. To the extent permitted by applicable laws, IHG reserves the right of final interpretation of these Terms and Conditions. Members must make any Promotional inquiries within 60 days of the end of the campaign Promotional Booking Period. Next articleReader Question: Korean Air Intra-Asia Awards Not Available Using GOL Smiles?